This is an appointment that a patient has booked either in advance or on the day but not attended or cancelled. If you’ve been into Quay Lane Surgery recently, you may have noticed the white-board behind the receptionist’s desk. This shows the number of minutes of appointment time lost during the month when patients have failed to turn up or cancel their appointment. The Quay Lane Surgery Patient Participation Group have actively been highlighting this issue in their newsletters. This is the equivalent of 30 full days of GP appointments or 22 full days of nurse appointments lost! It is disappointing that despite the campaign to reduce DNA's the statistics highlight that there has been no reduction between 2017 and 2018. The figures are consistently high! By sharing its DNA data with you the practice is aiming to show just how much time is being lost through missed appointments. In a recent search of our systems we found that in one week alone 39 appointments were lost because patients did not turn up for their appointment. This amounts to 6 hours of wasted time that could have been offered to other patients. As there is a very high demand on the appointment slots that we have available this is a very serious waste of our resources which ultimately affects you as a patient. Those 39 slots in that week could have been given to 39 other patients. The vast majority of our patients attend their appointments or let us know if they cannot attend or no longer need them. We really appreciate this as it means we can free those appointments up to be used by other patients. However, a small but significant number of patients miss their appointments without cancelling them. This means the doctor or nurse is waiting for the patient to arrive, when they could have been seeing another patient. All DNA’s are documented on patient records and patients may be asked to explain to the GP/Nurse/Practice why they failed to cancel their unwanted appointment when they next attend. Everyone can help! 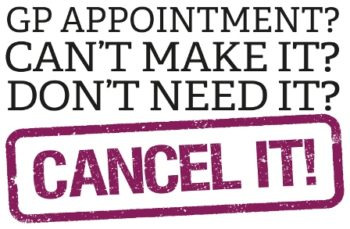 One of the most important ways you can help is by making sure you cancel your appointment if it is no longer needed. Your appointment can then be given to someone else. We therefore ask that if you cannot attend please contact us by telephone anytime from 8.30am to 6pm Monday to Friday. If you booked your appointment on-line then you can also cancel it on-line or by letting us know. Please let us know if you can’t attend within 24 hours of your appointment so that we can offer it to someone else. When you make an appointment please set yourself a little reminder so you are less likely to forget. Help us to help you remember the next time you require an appointment you may get one of those cancelled slots! Thank you.